GCA Altium advises FuelsPricing on its strategic agreement with Professional Datasolutions, Inc.
GCA Altium acted as exclusive financial advisor to FuelsPricing, the leading independent provider and integrator of retail and wholesale fuel pricing software solutions, on its strategic agreement with Professional Datasolutions, Inc. (“PDI”), a Genstar Capital and TA Associates portfolio company. Founded in 1990 by current CEO, Mark Scanlon, FuelsPricing began as a custom solution for Esso UK to support the market-changing “PriceWatch Campaign”. Following significant development to build this solution into a broader commercial offering, FuelsPricing rapidly grew to become a corporate standard for fuels pricing by automating the key aspects of pricing both retail and wholesale fuel sales. FuelsPricing has experience providing analysis and pricing for more than 35,000 retail service stations and over 100,000 business-to-business shipping locations for petroleum wholesalers. It services customers in over 50 countries ranging from independent retailers to the large multi-national integrated oil companies. PDI is a leading global provider of enterprise software solutions to the convenience retail, wholesale petroleum and logistics industries. It helps convenience store retailers and petroleum wholesale marketers worldwide thrive in a digital economy with enterprise management software. Over 1,500 customers operating more than 200,000 locations trust PDI to optimise their entire operations whether they are a single site, multi-site, dealer or a franchise operator. PDI’s enterprise software, wholesale and logistics management software solutions and retail back office systems have been designed around the evolving needs of customers for more than 35 years. 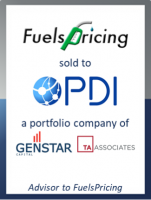 FuelsPricing is highly complementary to PDI’s Enterprise software platform, and provides PDI with nearly three decades of expertise in the complex field of fuel pricing forecasting and optimisation. FuelsPricing is a prime example of a company using proprietary technology to deliver a software-driven solution offering in a highly efficient and profitable business model. The strategic agreement represents GCA’s 16th in the tech-enabled services space to date in 2018, reinforcing our reputation as one of the leading M&A advisors in this sector. Mark Scanlon, founder and CEO of FuelsPricing, said: "We are delighted to reach a strategic agreement with PDI. PDI’s focus on innovation, global reach, industry expertise, and reputation for excellent customer service and employee engagement align seamlessly with FuelsPricing’s long-term goals and evolution. GCA Altium assisted our team to navigate the process that was initiated in February 2018. Without their support I highly doubt the agreement would have happened. I did not appreciate the level of the work effort involved at the outset and the daily support from the GCA team was first class." Jimmy Frangis, CEO of PDI, said: "We are excited to add the FuelsPricing solutions to PDI’s software platform. FuelsPricing was an early innovator in designing pricing systems and algorithms that have since become the price optimisation engine of choice for many of the world’s most successful fuel operators. The addition of FuelsPricing allows PDI to extend its leadership in the global fuel industry to front end systems, helping our customers optimise and drive revenue and margin to improve overall business performance." Adrian Reed, Managing Director at GCA Altium, said: "We are delighted to have advised FuelsPricing in achieving this strategic agreement. Helping entrepreneurs understand the complexity of the process and supporting them through the negotiations is what we do. I was particularly pleased to convince Mark of the value of our services. We look forward to watching FuelsPricing continue to develop alongside PDI."